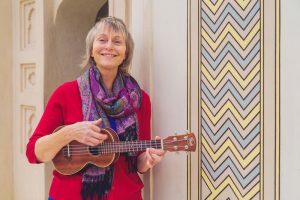 This is a post about harmony and how it works with ukulele. For me, playing ukulele means coming into close relationship with the beautiful harmonies of music. It’s much more direct and practical than when I’m playing violin, or piano, or even bass guitar. When we play ukulele we’re always multi-tasking. We strum the rhythm; we sing the melody and the words. And we play chords – the harmony. The first thing that most people learn on the ukulele, after how to tune it, is how to play chords. Harmony is a really big topic that’s a huge part of classical music education. Here’s a really brief definition of harmony: it’s the chords and chord progressions or patterns of chords, underlying a piece of music. Harmony can also refer to singing – adding vocal harmonies to a melody. Every piece of music – whether it’s a three-minute pop song or a Beethoven symphony – has an underlying harmonic structure or pattern of chords. Luckily for ukulele players, pop songs have much simpler chord structures than a classical symphony. A huge number of wonderful songs have only three chords. Billions of dollars have been made by songwriters coming up with new variations on three chords. Sometimes it’s even easier than this: some songs have very regular repeating chord patterns. Examples of this are The Lion Sleeps Tonight, I’m Yours and Don’t Worry Be Happy. A lot of folk and country and gospel songs also have very simple chord patterns. There are some iconic four-chord patterns that show up frequently throughout the music industry. Australian comedians The Axis of Awesome have a show, Four Chords, based around one of the classic four-chord progressions. In the key of C this would be C, G, Am and F.
Another popular four-chord progression is the “doo-wop” pattern: C, Am, F, G7. Stand By Me, Blue Moon and the Monster Mash are all songs with a doo-wop chord structure. The 12-bar blues is a progression that uses three chords plus a couple of 7th chords, in a regular repeating pattern. Many pop songs are based on the 12 bar blues. However, some other pop songs have a much more complicated harmonic structure with lots of different chords. Many songs by The Beatles, Carole King, Burt Bacharach, Queen and Brian Wilson of The Beach Boys come into this category. This makes these songs harder to play without using chord charts or sheet music. And you usually can’t simplify the chords to make the song easier to play, because the beautiful chords are a big part of what makes the song so distinctive. While playing ukulele I’ve gradually developed a sense for the chord patterns of the music. With many three or four chord songs I now intuitively know which chord is coming up next. It’s a great feeling, because it means I’m freed from always working off a printed chord chart. And I don’t have to learn the chords by rote. Here’s a link to my post about the pleasures of playing music by heart. The key is a pattern of chord relationships. On ukulele in C tuning (which is the most common ukulele tuning) some keys work better than others. By this I mean the chords are easier to play. The best keys for a C-tuned ukulele are C; G; D and A. If a piece of music is in the key of C, the harmonic structure will probably start and finish with a C chord, and other chords that are likely to also appear are F and G, and possibly Am (A minor). Some online music resources (e.g. UltimateGuitar.com) have a transposition feature so you can shift the key to suit your requirements. If you don’t like the look of the chords in a particular song, use the key finder arrow to see if you can find a more ukulele-friendly key. You can play any key on a ukulele, if you can play barre chords. 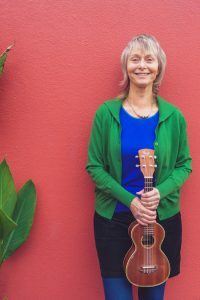 Many more skilled ukulele players use barre chords. This makes shifting music into different keys easy. However, barre chord playing isn’t for everyone. And it’s definitely not suitable for beginners. I don’t usually play barre chords myself – I’d rather shift the song into an easier key. I am always aiming to be as inclusive as possible. If I use barre chords I will immediately scare off newer players. A capo – a gadget that stretches across the fretboard – shifts key in a similar way to barre chords. However capos are problematic for ukuleles because of intonation problems. 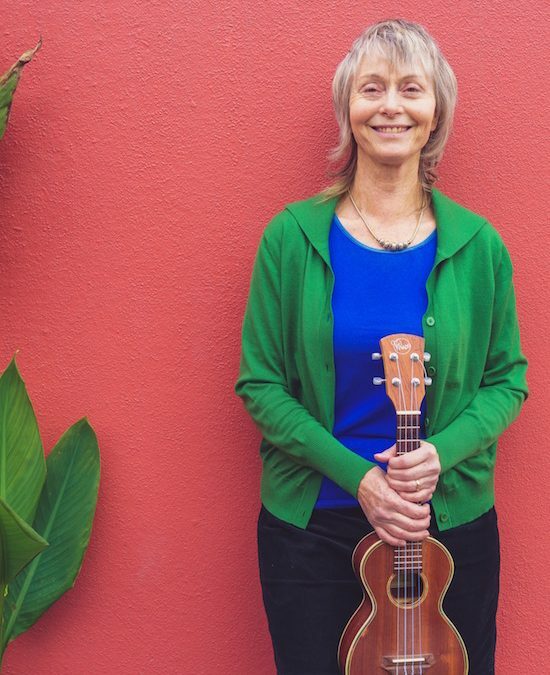 If you have an expensive ukulele – over $500 – you could use a capo. But the cheaper models of ukulele probably won’t stay in tune with a capo. Another big consideration with harmony is finding a key that suits your voice. This depends on your vocal pitch. Men’s and women’s voices often suit different keys. Learning harmony comes gradually with practice. Some people find it easier than others. You might find you’re activating a talent you didn’t know you had. If you know the words, and you know the strum, and the song only has three chords, you’re well on the way to being able to play by heart.